The dominant fact emerging this year is that whatever faith in government voters once had has been pretty well destroyed both by self-serving politicians willing to disingenuously promise anything for their votes and the failure of government at all levels to deliver on those promises. Establishment politicos of both party’s couldn’t believe the appeal of the attacks leveled on them by Vermont Senator Bernie Sanders and Republican Donald Trump during the primary season and were dumbfounded at how well their attacks played with voters in both parties. To them, both Sanders and Trump were playing to tiny minorities within their respective parties and Republican establishmentarians were shocked when Trump actually wrested their party’s Presidential nomination from the hands of men and women committed to establishment policies and more “experienced” in the ways of Washington. It never occurred to them that it was Mr. Trump’s promise to upset the comfortable bi-partisan status quo those candidates represented that was the foundation of his appeal. Had any of them looked in the mirror they would have discovered that they rather than Mr. Trump’s strengths that have put him within a hairsbreadth of the White House if only because the Democrats, tone deaf to the end, managed to nominate a candidate who is perhaps the quintessential representative of the status quo with a record of dissembling that has members of her own party wondering if she is capable of uttering a truthful word about anything. This concern was underscored last week as transcripts of many of the speeches she delivered to various audiences before announcing for the Presidency last year finally reached the public. The speeches were delivered mainly to large private meetings arranged by several mega-banks and Wall Street firms and reportedly “earned” the former Secretary of State more than twenty six million dollars in speaking fees. She and her campaign have repeatedly refused to make any of them public, but last week WikiLeaks which had hacked into the accounts of some of her top advisors to find the hidden speech texts released a number that explain just why Americans find her so untrustworthy. In one, Mrs. Clinton told her audience of fellow insiders that it is sometimes necessary for politicians like her to have “both a public and a private position” on politically contentious issues, a virtual admission that she sees nothing wrong with lying to the American voter. That she admitted it even in private came as something of a surprise to many, but the fact that she and others do it surprised virtually no one. The problem is that too many politicians share Mrs. Clinton’s proclivities, something Second Amendment advocates have known for some time. The NRA is forced to spend a good deal of time each election cycle correcting the record when anti-Second Amendment candidates misrepresent their own records as they attempt to woo pro-Second Amendment voters in states where most voters fall into this category, but I don’t remember many instances as flagrant as what’s going on in Montana right now where Governor Steve Bullock simply lies about his support for gun rights as he seeks re-election. In a recent debate with his Republican opponent, Mr. Bullock took credit for working with his state’s legislature to enact the “Castle Doctrine” which allows a homeowner to use armed force to defend his or her home if that proves necessary, failing to note that he had absolutely nothing to do with passing what has been the law in the state since just after the Civil War or the up-date that passed the legislature and was signed into law before he ever became governor. In his haste to falsely reassure Montana gun owners that he is their friend, Mr. Bullock failed to mentioned that since he’s been Governor he’s vetoed more than half a dozen pro-Second Amendment measures that have made it through both houses of the state legislature leading the National Rifle Association and other pro-Second Amendment organizations to endorse his Republican opponent. It’s just the sort of tap dance one would expect from a devote’ of Mrs. Clinton’s political techniques and its why so many have lost faith in professional politicians for whom the truth seems but one option. 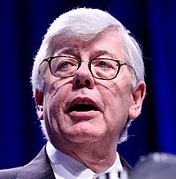 David Keene is the Opinion Editor of The Washington Times and former President of the National Rifle Association.